There is currently no Organising Committee in the ACT. We would welcome expressions of interest from people who would like to organise events. Please use the contact form to let us know if that’s you! 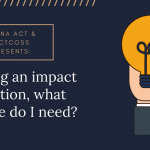 SIMNA ACT Blog: I’m doing an impact evaluation, what evidence do I need?